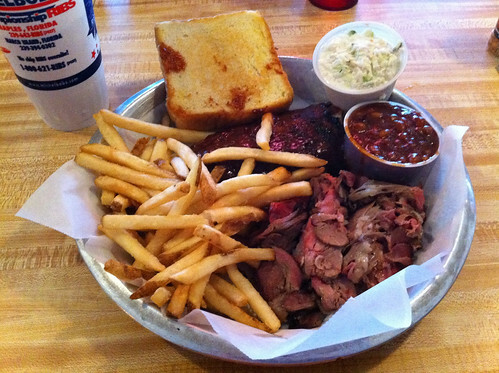 I began following the boys at Pork Barrel BBQ on the interwebs awhile back. What caught my attention was the catchy name and the story of how they chose it. It seems the founders were US Senate staffers in Washington, DC. While their bosses were debating Pork Barrel Spending, they were debating their BBQ dining options in the greater DC area. 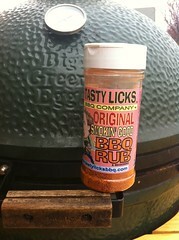 The two things collided and what you have is a catchy name for a line of BBQ sauces & rubs. 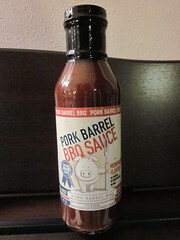 Recently, I was perusing the sauce selection at my local grocer in the midwest and was surprised to see their Pork Barrel BBQ sauce on the shelf. 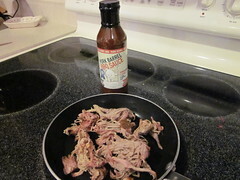 I snapped up a bottle of the original sauce, headed for home, and put together a couple of sandwiches from the leftover pulled pork that was waiting for my in my refrigerator. 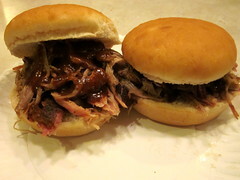 I piled a couple of buns high and applied a liberal amount of Pork Barrel sauce. It's a thin sauce and the vinegar twang outpaces the catsup base that's listed on the label. 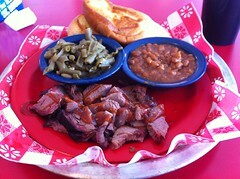 I'd call it a variation on a Carolina style sauce. While I enjoyed the sauce overall, it was a little too"vinegary" for my taste and I'd like a little more pepper. But that hasn't stopped me from continuing to use it. I'll also try their sweet sauce the next time I'm in that grocery store. 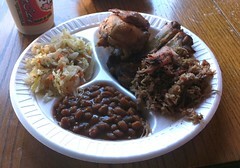 I recently attended the Business of BBQ with Mike & Amy Mills in Murphysboro, IL. I met lots of great folks, including Carey Bringle of Peg Leg Porker. 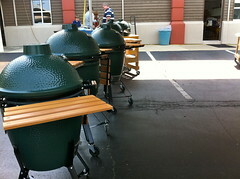 I've read about Carey, his competition team, his team mates, and his line of signature BBQ products. Carey is a seasoned competition cook and I'm really glad that I got to know him. 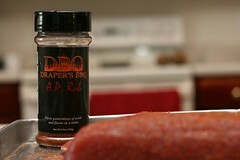 As the 2-day class wrapped up, Carey tossed me some of his rub to try out and reveiw. 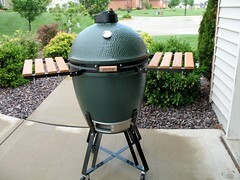 So I brought it home and finally got around to firing up the Big Green Egg and giving it a try. 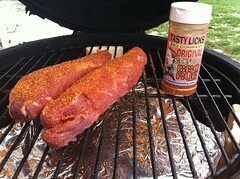 This is a classic Memphis style dry rub. It's not sweet. In fact, I'm not sure there's any sugar in it at all. But that's okay. 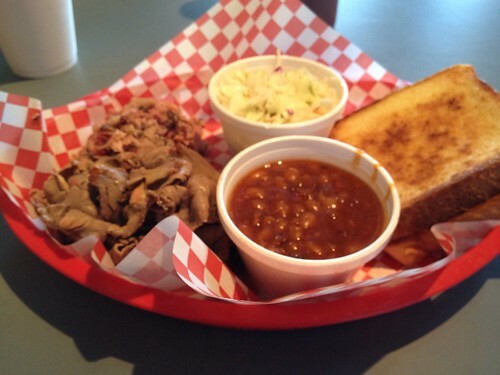 It has a very rich, earthy flavor with a slight hint of chili powder or something similar. Don't get me wrong...it's not spicey, but it has a nice flavor. 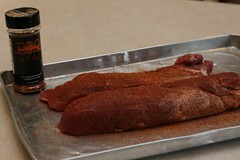 If you've ever eaten ribs at the Rendezvous in Memphis, this rub is similar to the dry rub they serve. 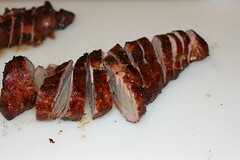 I like to taste test rubs on chicken. I think you get a better idea of the flavor profile with the lighter flavor of chicken. I hit some chicken with Peg Leg's rub and smoked it for a couple hours. 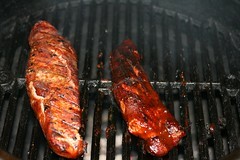 I thought the rub had a great taste and went great with chicken. I'm sure it'll go great on pork too, and I'll be trying that soon. Peg Leg has a couple of other products available at their website, as well as information on the competition team. 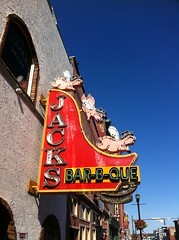 You can also catch up with them at Memphis in May.